What you need to know about the holidays in Italy, from the Feast of the Immaculate Conception to Epiphany. Enjoy people and food at a week-long program, Tuscan Women Cook, held in a Tuscan farmhouse. Co-author of Chow! Venice: Savoring the Food and Wine of La Serenissima shares her tips from four Christmas/New Year’s holidays spent in Venice. When and where you need to be to see the Pope, and how to get tickets when necessary. Let the most highly prized truffle in the world be your guide to Alba. A Tuscan olive oil producer shares the ins and outs of olive oil with Dream of Italy. Marlena de Blasi’s true story of finding love in Venice. 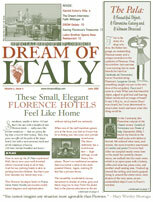 Dream of Italy speaks with the Rome bureau chief about his new assignment and observations of Italian life.